From the Holiday Special to The Mandalorian, the Star Wars race that counts Boba and Jango Fett among its numbers has a long history in and out of the narrative of the galaxy far, far away. It’s one that Star Wars has long been enamoured with—but its portrayal has ebbed and flowed in fascinating ways over the last four decades. Let’s take a look, shall we? The appearance of Boba Fett in, at first, the animated portion of the widely-derided Star Wars Holiday Special in 1978, and then more successfully in Empire Strikes Back in 1980, wasn’t actually meant to define his people in the way it ultimately would. At first, Fett wasn’t even meant to be Mandalorian—just his armour was. But the vivid imagery that turned Boba into an icon among fans lead to the fledgling Star Wars expanded universe fleshing it out into a backstory for the Mandalorian people at large. At first, there wasn’t much to go on—there had been plans for a group of white-armoured “supercommandos” from the Mandalore system to appear in Empire, with Ralph McQuarrie’s iconic concept art eventually being appropriated to use for Boba Fett. The only reference to Mandalorians as a people came in the novelisation of the film by Donald F. Glut, which described them as evil warriors defeated during the Clone Wars by the Jedi. But it wouldn’t take long for the Mandalorians to basically be transformed into Boba Fetts at-large, right down to their armour. Marvel’s Star Wars comics introduced Fenn Shysa and the Mandalorian Protectors, the Mandalorian army-for-hire that fought in the Clone Wars before being all but wiped out, with Shysa eventually helping to form a resistance on Mandalore to free the planet from now-Emperor Palpatine’s rule. In the mid ‘90s, with the Expanded Universe now flourishing—and with Star Wars comics having moved on from Marvel to Dark Horse—we got one of our first major divergences from this mercenary drifter interpretation of the Mandalorians in the epic Tales of the Jedi series. It explored the ancient past of the Star Wars galaxy at an unprecedented scale, examining a time period 4,000 years before the events of the original trilogy. It’s here, in an epic war between the Sith and the Old Republic, that we’re introduced to Mandalore the Indomitable and the warrior clans of the Mandalorian Crusaders, roving factions of deadly raiders that valued war above all—a value and a societal structure that the Mandalorians would hold on to across the rest of the species’ future interpretations. These early interpretations still mostly kept the Mandalorians as battle-craving warriors who’d work for any side for a price (in keeping with Boba’s bounty-hunting profession), as would further explorations of ancient Mandalorian society as fractured groups of clans of raiders, roaming around looking to be hired for any scrap they could. 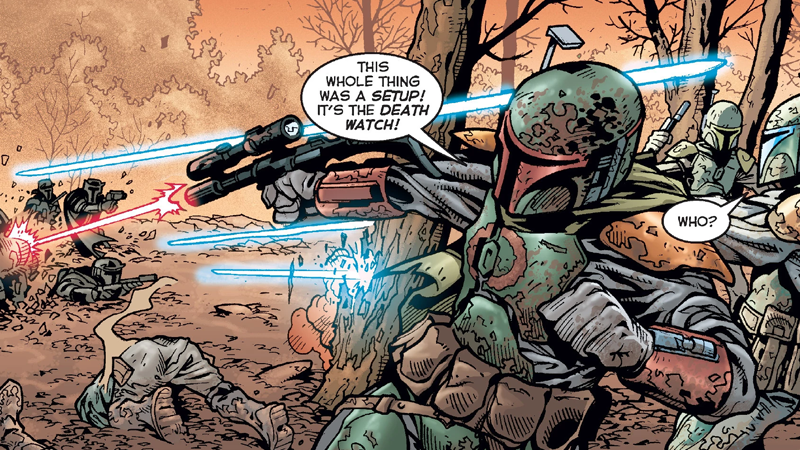 But after Jango Fett’s canon arrival in Attack of the Clones, a tie-in comic from Dark Horse called Jango Fett: Open Seasons would go on to form a moral inflection point that would continue to be a part of Mandalorian interpretations for years. 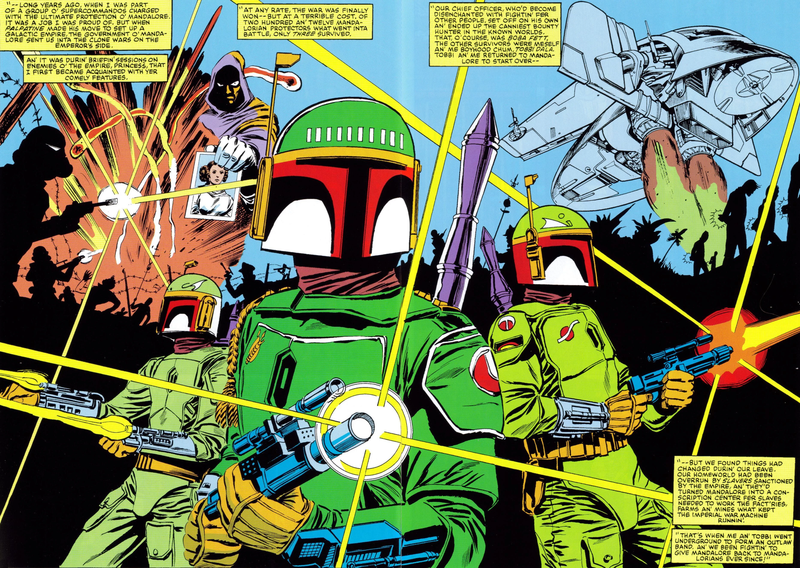 The comic established Jaster Mereel (one time considered to be the true identity of Boba Fett in the beloved Tales anthology series, before Jango came along) and the Journeyman Protectors of Concord Dawn. 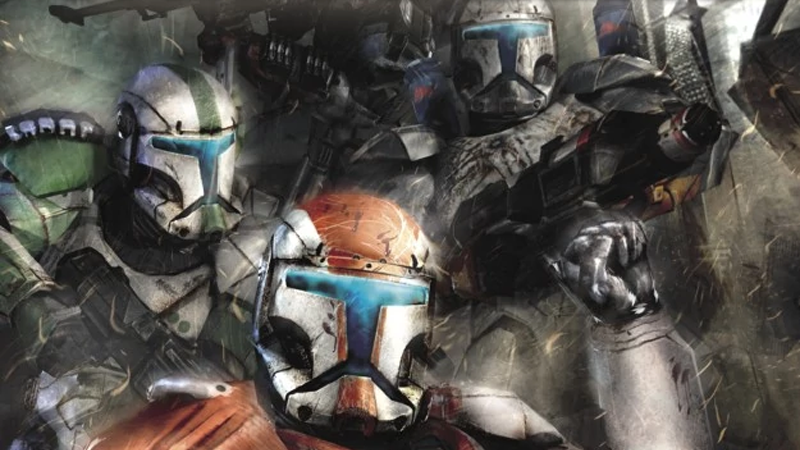 They were a group of lawmen who eventually would form the True Mandalorian faction in a civil war initiated by Jaster to unite Mandalorians under a single noble code of honour, moving away from their rougher roots in opposition to the Death Watch, a faction that wanted to keep to the old violent ways of war. As we inched further into the 21st century with the rise of the prequel movies, the ethos of the Mandalorian stories told by the expanded universe evolved from the sense of mercenary lawlessness Jaster Mereel fought against. They became tales that smoothed out the rougher edges of the group, giving the race an almost Klingon-esque revamp as code-driven warriors who respected battle rather than necessarily thriving on it. Although, there was still a consistent point of conflict between different internal sects, and even in post-Return of the Jedi-set novels the Mandalorians were still mostly disparate mercs for hire. This wasn’t just occurring in more “modern” interpretations of the Mandalorians, but their past, too. It’s in this period you get Knights of the Old Republic’s exploration of Mandalorian history beyond the old Tales of the Jedi comics. It revealed how this honour-driven society of disparate clans was brought into the greatest battle of all in its ongoing conflict with the Sith Empire against the Jedi, a war that brought about the ascendance of both KotOR protagonists, Revan and the Jedi Exile. But it’s perhaps best defined by the work of one Star Wars writer in particular, rooted in the time of the prequel movies rather than Star Wars’ ancient past: Karen Traviss, the author who went on to define Mandalorian culture in fundamental ways through her highly popular Republic Commando novels. While primarily focusing on the Clone Troopers on the front lines of the war that kicked off in Attack of the Clones, over the course of her series Traviss fleshed out the Mandalorian culture on a scale like never before. Traviss expanded Mando’a, the Mandalorian language, into a vast vocabulary, while emphasising the familial bonds as a vital part of Mandalorian culture, a vast diaspora that incorporated not just actual Mandalorians but beings of other species accepted into society as fellow Mandalorians. The popularity of the Republic Commando books and Traviss’ portrayal of Mando society pretty much cements this as the de facto interpretation of Mandalorians in the eyes of many Star Wars fans...but a big change was about to come and upend everything. The Mandalorians played a major role in the second season of the animated Clone Wars series—a show that, in the complicated realm of what was considered “true” Star Wars canon back in the pre-Disney days, was considered along with the films as part of the upper echelons of source material, given George Lucas’ direct involvement. 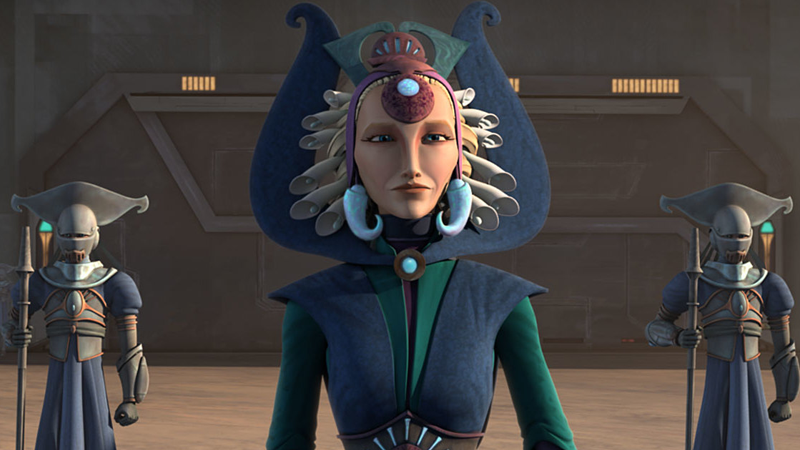 That lead to a particularly wild furor when it was revealed that the Mandalorians of Clone Wars were no longer a warrior society, but a peace-loving independent system run by a parliament of pacifists led by a Duchess named Satine. These “New Mandalorians” as a faction had cast out the warrior ways of old and those who supported of them—an insurgent group united under the Death Watch banner—in the wake of a civil war that happened in the years prior to The Phantom Menace. The move was highly controversial among fans, given that it effectively de-canonised everything Traviss’ Republic Commando novels had built up about Mandalorian society—which, alongside contractual disputes over her work, lead to the writer’s swift departure from writing Star Wars fiction, leaving her novel series (which had started to expand beyond the Clone Wars and into the Rise of the Empire) unfinished. Since the Clone Wars completely upended what we knew about Mandalorian society, the Mandalorians have mostly been left alone—it’s only really in the animated follow-up to the series, Star Wars Rebels, that we got to explore a canonically-approved look at the Mandalorians under Imperial rule, thanks to protagonist Sabine Wren. And while what little we saw suggested a move back to the more militaristic House-based interpretations Clone Wars had left behind, its focus was more on how the Mandalorian people threw off the yoke of Imperial occupiers to once again become an independent system. By the time Rebels came to an end, a new Mand’alor (as the name was now stylised)—Bo-Katan, Satine’s sister—was established, and it seemed like a balance between the peacemakers of the Clone Wars era and the honorable warriors that came before was on the way. 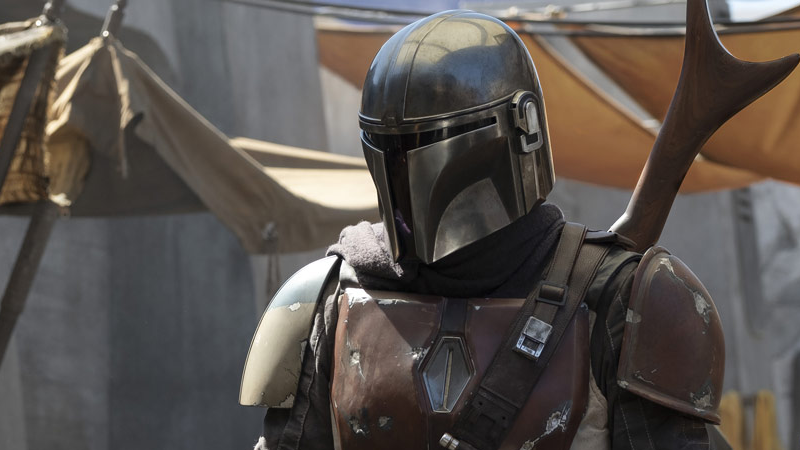 We’ll have to wait until next year to see if that’s an interpretation that will stick around for a while in Disney’s canon, or if it’s just the latest chapter in the ever-evolving world of the Mandos. Given Star Wars’ fascination with the people behind those T-shaped visors, it’s likely to be the latter rather than the former.